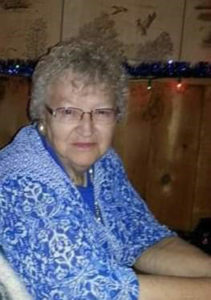 Doris Mae Collins, age 81, of Adams, Wisconsin passed away Monday, January 28, 2019 at Marshfield Medical Center in Marshfield, Wisconsin. Friendship, Wisconsin. Pastor Sam Downey will officiate. Visitation will be 10 a.m. until the time of service on Monday at Roseberry’s Funeral Home. Doris was born January 31, 1937 in Adams, Wisconsin to John M. and Hazel L. (Bisbee) Boer Sr. She grew up in Adams and graduated from Adams-Friendship High School in 1956. Doris married Kenneth Collins on April 25, 1959 in Adams, Wisconsin. She worked various jobs in town, including her favorite jobs at Mr. Burger and Goggin Pharmacy. After retirement, Doris and Ken operated the Craft Shop in Friendship. She was an accomplished quilter and seamstress. Doris enjoyed playing cards, bingo, connecting with new family and friends on Facebook, and spending time with her family and friends. Doris was a member of Eastern Star. Memorials may be directed in Doris’ memory to her family. Doris was preceded in death by her parents, John and Hazel Boer; husband, Kenneth Collins; daughter, Deb Collins Warren; brothers: Roger Boer, Donald Boer and John Boer Jr.; and sister, Elizabeth Rose. Pam, Michelle,and Marge: I”m so sorry for the loss of your mom, its a very hard thing to go through. I’m sending my deepest sympathy to you all and your family. Your memories will help carry you through this difficult time. Praying for your family. Our hearts go out to you all, it has been quite a week. Aunt Doris was such a sweet talented lady. I will warmly remember playing with you all as kids I remember board games and lots of fun family get togethers. May all the happy memories comfort you in these hard times. Dad and Doris are having a family reunion smiling down on us. Sorry to hear of your Mothers passing. Thinking of Sisters, missing Deb too! Love to you all. She was a kind hearted and good woman. So sorry to hear of Doris passing away.my prayers are with you. Prayers sent to the family at this difficult time. So sorry for your loss. I’m Lester Collins’ Grand daughter and just connected with Doris a few years ago. So thankful for all the family history she told me about that I never would have known. We are so sorry for the loss of your Mom, Grandma, and Great-Grandma. She was a special person, so full of life and wit. Kadehn, Braeyah, and Aliciah always enjoyed visiting with her. We will miss “Grandma Dodo Bird”. To All of Doris’ family…..may God, Family and Friends bring comfort to you during this difficult time. I worked with Doris many years ago at Goggins Pharmacy….what a pleasant lady to know and a delight to work with…..so sorry for your loss!! My deepest sympathy to all of you!! So sorry for your loss. May good memories fill your hearts and minds as you grieve. Prayers are with the family during this difficult time. She always had a smile and was a very talented lady. To the whole family of Doris, it just does not seem possible that God would take her away from her fun-filled happy life. She kept all of us wondering what would be the next thing on Facebook that she was involved in. I knew Doris almost all of her life, living in the area and being in 4-H and our brothers were so close too-especially John whom God called home on the same day. Heaven has added two wonderful people. My deepest sympathy. So sorry for your loss. Doris’ happy smile and friendliness will be missed by many. Margie, Pam and Shelly, I am deeply sorry for the loss of your mother. Prayers to you and your families during this difficult time. So sorry for you loss. God’s comfort. So sorry for the loss of your Mom. May God be with each of you and give you peace. Our prayers for the family as you remember all the good times in your lives together. So sorry to hear about Doris. Enjoyed visiting with her over the years. My sincere sympathy to the family. So sorry for your loss. I remember seeing a lot of her over the years. Always so nice to talk to her when I would go with my Dad (Joe). Sorry for the loss of your Mom, she was a great lady and wonderful quilter. Sorry to hear of your Mothers passing. Thinking of you and your families. Prayers ! So sorry for the loss of this wonderful,loving caring human being.She left many great memories for all of us who loved her to share. Pam, Margie, Shelly & all of Doris’s family- Unbelievable to lose these two special cousins at the same time. Hans & I feel your pain also. May God give you all comfort & give us all strength to get through this. So thankful God let us all have our trip to Michigan with John(Jack) & Jane, Doris & Betty! Still miss Kenny & Debby too. Prayers and sympathy. your mom and dad were wonderful and a big loss to friends and your family. To the family of Doris…….She was a sweet lady and will be greatly missed by all who knew her. She is with Ken now and they are in the warmth of Heaven and God’s hands. She helped me a lot with quilting questions and I will never forget her. Wayne, margret, Danielle…im so sorry for your loss. My thoughts and prayers are with you and your family. Im sure she s in heaven happy to be with your mom looking down on all of you. My thoughts are with the family. She was a wonderful , sweet, funny lady. She will be missed in oh so many ways. Sending prayers for Comfort & His Peace , to all. So sorry for your loss. Love & prayers to the whole family. Always enjoyed visiting with Doris, she was such a talented woman too. So sorry for her family’s lost. So sorry for the loss of your Mother…Doris…I will miss her dearly. You are in my thoughts and prayers during this trying time. She will be deeply missed. RIP Aunt Dodie.